A slip up on the Apple UK site revealed the iOS 4.1 launch date - they’ve fixed it now, but the secret is out. The new version brings bug fixes, new features, but most importantly - fixes the iPhone 3G performance, which has been glacial up till now. 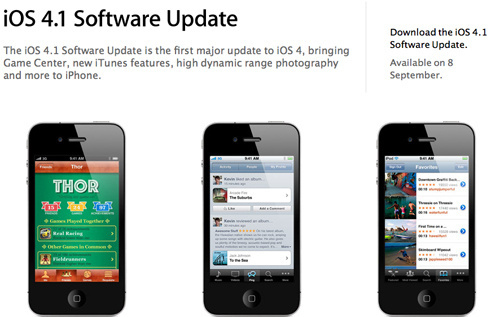 The iOS 4.1 update is expected next week, and the UK site gave us a specific date - September 8, Wednesday. The US site proved better at keeping its secrets and stuck with “coming soon”. For iPhone 3G owners, the biggest gain from iOS 4.1 will be the much improved performance. Check out the video below, which “races” a 3G running iOS 4.0 against the same unit running 4.1. The UI becomes more responsive and beats v4.0 across the board with a pretty big advantage in some places. It’s not as good as an iPhone 3GS but it just might be enough for 3G owners to jump ship. Of course, iOS 4.1 brings a load of other incentives too - bug fixes, Game Center, HDR photography, HD video uploads and TV rentals. The next, iOS 4.2 update is also around the corner (it will be available on the iPad too), being scheduled for November launch. One survey on one site showing 75% of people who responded do not have any problems does not match with what you are trying to conclude. Don't they teach kids anything in schools these days.